David Tennant is a famous actor from Scotland who has risen to prominence on the theatre stage and in the cinema. He won the TV viewers’ hearts with inimitable acting in the series Doctor Who and Jessica Jones. 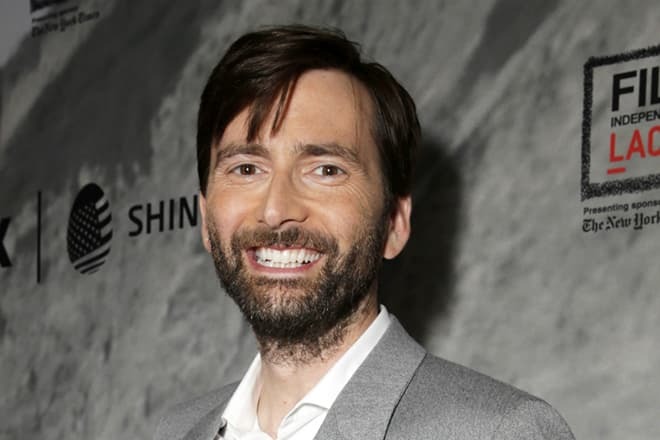 Thanks to a bright role of Giacomo Casanova, David became the favorite actor of millions of women, while the role of Barty Crouch, Jr. in the film Harry Potter and the Goblet of Fire showed Tennant’s ability to play insidious villains. The real name of the celebrity is David John McDonald. David took the name of one of the members of the band Pet Shop Boys as a stage name. The future actor was born in the small Scottish town of Bathgate on April 18, 1971. David's father, Alexander McDonald, served as Presbyterian minister in Ralston. The boy grew up with sister Karen and brother Blair, who were much older than him. The father wanted his son to follow in his footsteps and become a priest, and his mother urged his son to pursue a career of a lawyer or attorney. However, at the age of four, David knew that he would be an actor, and he did not give up his dream even though his parents did not support him. 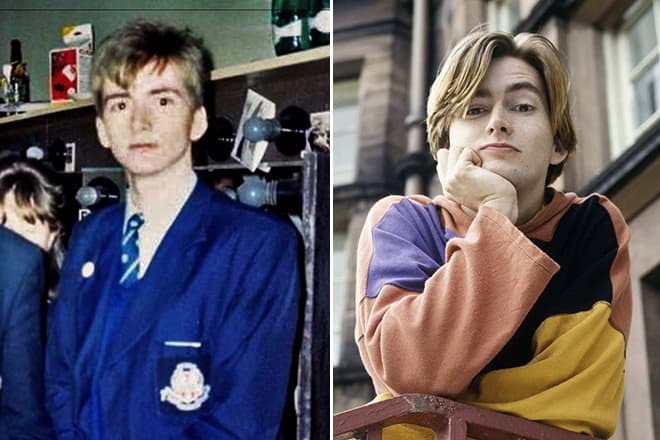 After graduation, Tennant succeeded in entering the famous Royal Scottish Academy of Music and Drama. After graduation from the Academy Tennant worked in one of the theaters in his native Scotland for some time. His first roles, King Arthur and an assassin, got negative reviews. But these failures did not become an obstacle to the further development of David’s career. Soon the aspiring actor already performed on the stage of the Royal National Theater in London and played in the production What the Butler Saw. Since 1996, Tennant has worked for the Royal Shakespeare Company. The actor specialized in comic roles, playing Antipholus of Syracuse (2000). Besides, David showed unique acting skills in such productions as Romeo and Juliet, Richard II and Hamlet. However, the young actor strived to become famous in the cinema too. For the first time, Tennant appeared on television playing bit parts in the series Dramarama (1988), Strathblair (1992) and Bunch of Five (1992). They were followed by roles in the more famous series in England: Takin' Over the Asylum (1994) and The Bill (1995). 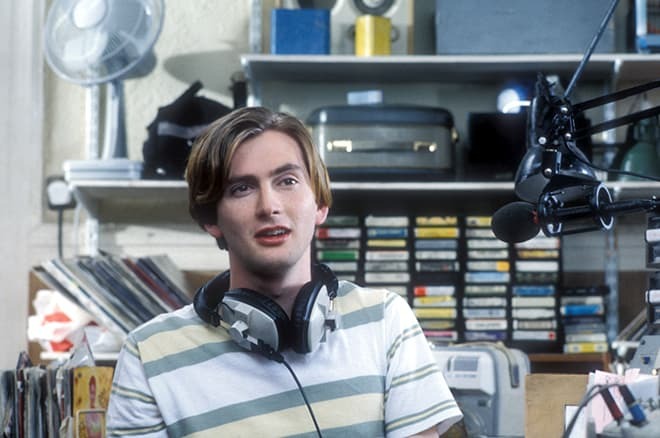 In 1996, Tennant managed to appear in the drama Jude, where the actor played a drunk student. Two years later, David played the role of Richard in the drama film L.A. Without a Map. Viewers and film critics liked the acting of the young actor, which contributed to the rapid development of his career. In 1999, David played the role of Captain Gerald Colthurst in the melodrama The Last September. One year later, Tennant starred in the popular TV series Randall and Hopkirk, as well as in Jonathan Newman’s comedy Being Considered. In 2000, David was also nominated for the Ian Charleson Award. The talented actor with a distinguished appearance was regularly invited to play diverse roles. In 2001, he starred in the TV series People Like Us, in 2002 he appeared in the projects Nine 1/2 Minutes and Foyle’s War, and in 2003 Tennant got a role in the film Bright Young Things. The same year, the actor received the Olivier Award nomination for the Best Actor. In 2004, Tennant managed to play in five projects. David starred in the drama The Deputy directed by Patrick Lau, Tom Vaughan's series He Knew He Was Right, Donald Rice’s comedy melodrama Traffic Warden, Angus Jackson's short film Old Street and the detective series Blackpool directed by Julie Anne Robinson and Coky Giedroyc. 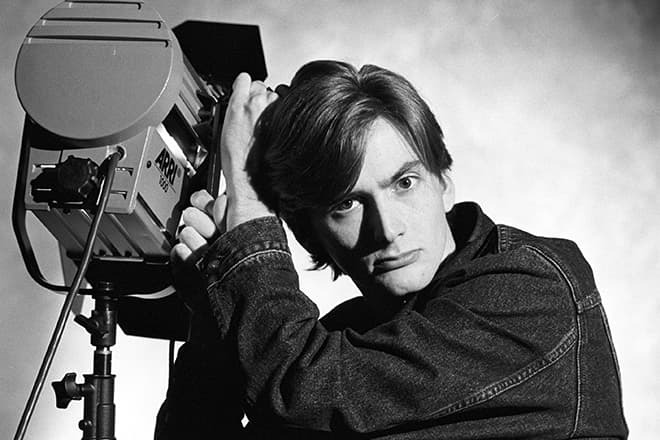 Numerous offers to play leading roles proved that Tennant became an in-demanded actor. His memorable characters conquered television viewers’ hearts and were highly appreciated by critics. 2005 brought David Tennant one of his best roles. The extraordinary actor played the alien traveler, the Doctor, in the science fiction series Doctor Who. The filming of the project began in 1963, and it has continued with short interruptions till the present day. David became the tenth actor who played the famous Doctor. He played this role until 2010 and had already been associated with this character. Tennant even had to get rid of a Scottish accent to play in the project. John Simm, Billie Piper, Penelope Wilton, and others also starred in this series. 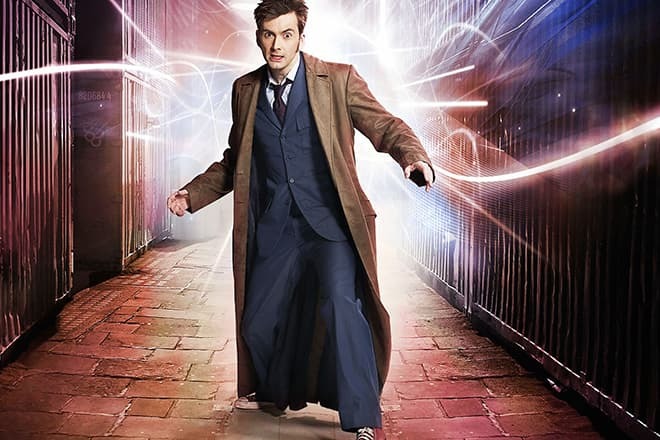 Having played the role of Doctor Who, Tennant’s childhood dream came true, and he has become world-famous. In 2006, the readers of Doctor Who magazine recognized the actor as the best performer of the role. In 2010, David won the National Television Award for Outstanding Drama Performance. David Tennant confirmed his status, playing leading roles in Sheree Folkson's melodrama Casanova and Christopher Menaul 's thriller Secret Smile in 2005. The same year, The Stage placed David in its "Top Ten" list of the most influential British television artists. 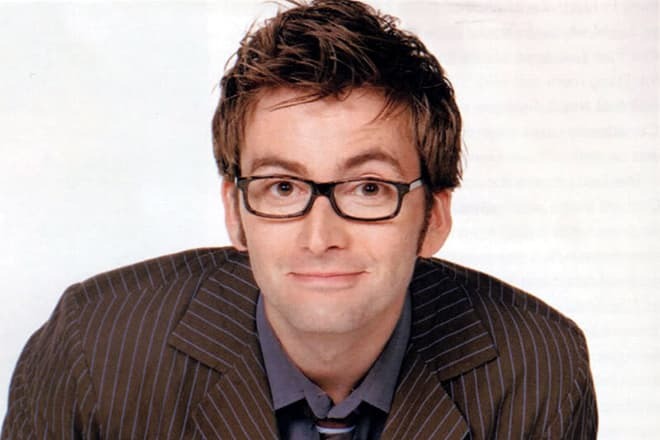 In 2006, The Pink Paper readers voted Tennant the "Sexiest Man in the Universe." When Tennant was at the height of fame, he starred in 2005 in the movie The Quatermass Experiment, where he played the role of Gordon Briscoe. That year, Harry Potter and the Goblet of Fire was also released, and David Tennant brilliantly played Barty Crouch Jr. Such famous actors of the Harry Potter universe as Daniel Radcliffe, Emma Watson, Rupert Grint, and others were David’s partners on the set. In 2006, the actor played Jean-Jacques Rousseau in the TV series The Romantics and Richard Hoggart in the drama The Chatterley Affair. Fans of the star could enjoy David’s acting in the drama Recovery (2007), the comedy Learners (2007), the historical film Einstein and Eddington (2008). Tennant portrayed a completely different character in each movie, but he always showed realism and expressive skills. They were followed by the science fiction series The Sarah Jane Adventures (2009). 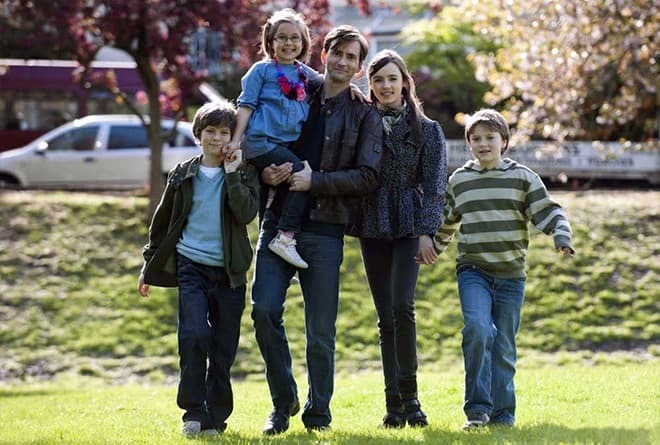 We should also mention the drama Single Father, where Tennant played the title character of Dave Tiler, who took care of the children after the death of his wife. In 2011, the actor won the TV Choice Awards for this role. The same year, David was expected to play the role of Thranduil in the film adaptation of the novel by J.R.R. Tolkien "The Hobbit," but in the end, Lee Pace played this character. In 2012, the actor starred in the TV series True Love along with Jo Woodcock, Lacey Turner, etc. In 2013, the detective series Broadchurch was released, and Tennant performed the leading role of detective Alec Hardy. British actress Olivia Colman played the role of David’s partner. The same year, the famous actor appeared in the TV series Spies of Warsaw, The Politician's Husband and The Escape Artist. Besides, he starred in the fantastic film The Day of the Doctor (continuation of Doctor Who) with Matt Smith, Billie Piper, John Hurt, and others. 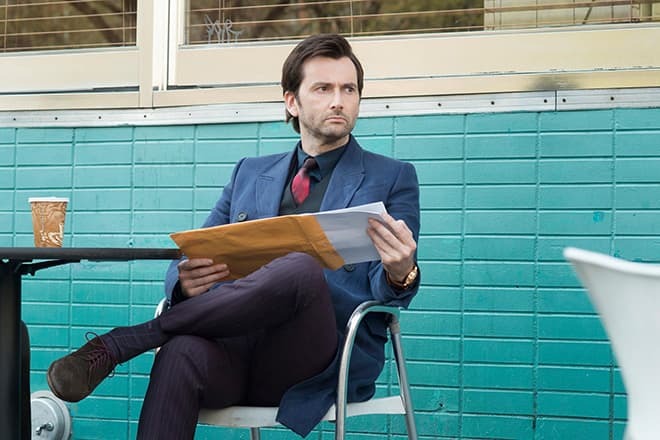 In 2014, the detective series Gracepoint premiered, and Tennant also played the title character of detective Emmett Carver. The talented actor wanted to try his hand at other spheres. From 2004 to 2009, David voiced a series of audio books for children of the British writer Cressida Cowell "How to Train Your Dragon." In 2008, Tennant participated in the reality show Trick or Treat. The following year, the actor appeared in the TV program for kids CBeebies Bedtime Stories, which aired on the BBC channel. In 2011, David Tennant conquered viewers’ hearts with his acting in the comedy production Much Ado About Nothing. The outstanding actor showed a brilliant performance together with Catherine Tate on the stage of Wyndham's Theatre, which each time caused a storm of positive emotions of the audience. Nowadays David Tennant continues to film and play unique and bright characters. Since 2015, he has begun to portray Kevin Thompson in the criminal television series Jessica Jones created by Melissa Rosenberg. The project was based on the Marvel Comics character of the same name. The series also starred Krysten Ritter, Mike Colter, Rachael Taylor, and others. The same year, the famous actor participated in the creation of Kevin Eastman’s animated series Teenage Mutant Ninja Turtles, as well as a game called Lego Dimensions. In 2016, David voiced a character in the cartoon Fireman Sam: Alien Alert. In 2017, the actor plans to present several diverse projects. So, Tennant played a leading role in Robert Mullan’s historical film Mad to Be Normal, participated in the voicing of the cartoon Ferdinand and DuckTales. Besides, this year the comedy You, Me and Him with David Tennant will be released. Fans follow the latest news about the life of their favorite actor carefully. The amusing photos that Tennant sometimes posts not only reflect his work on the stage and the set but also show his fantastic sense of humor. The bright appearance, charisma, and talent of the famous actor have always attracted women's attention. Tennant was recognized as the sexiest man in Europe four times. However, there were a few serious relationships in the star’s life. In 1999, David dated young actress Anne-Marie Duff, but in 2003 the couple broke up. 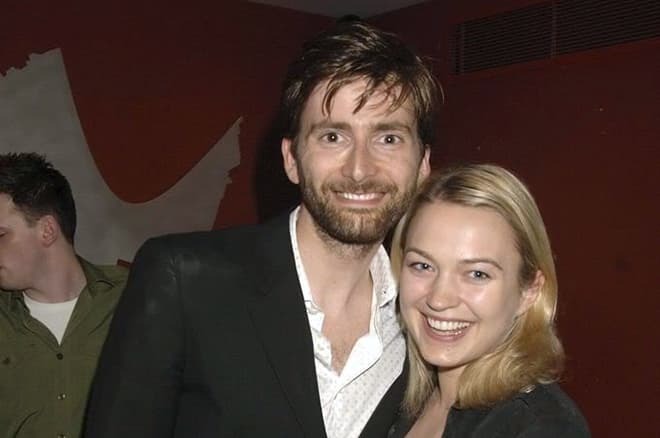 Then Tennant had a close relationship with actress Natalie Walter for two years. In 2005, the actor fell in love with Keira Malik, but their feelings did not develop into a long-term relationship. David's next girlfriend was Sophia Myles, and they dated from 2005 to 2007. 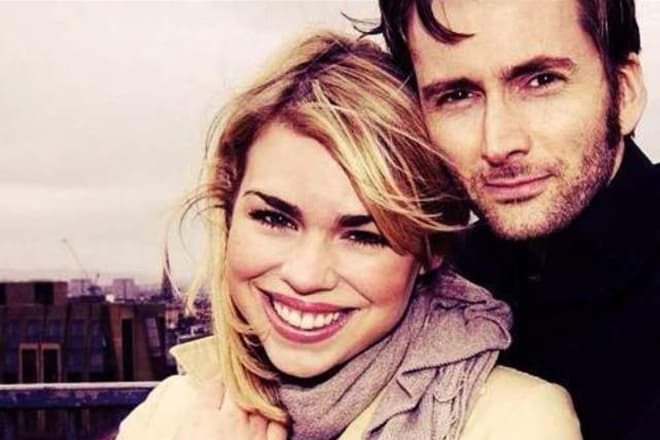 Tennant’s personal life changed after he met actress Georgia Moffett in 2008. 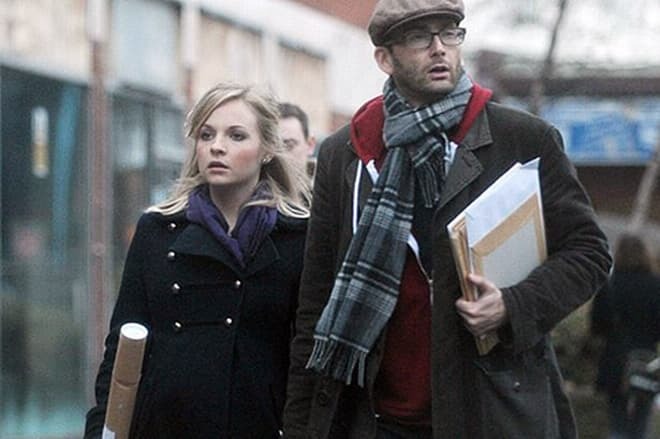 The couple met on the set of the series Doctor Who when Georgia played David's daughter. The stars married on December 31, 2011. Talented actor Peter Davison has become Tennant’s father-in-law. From 1982 to 1984 he played the role of the fifth Doctor Who. Tennant is an exemplary husband and thoughtful father. Now the actors are raising four children. On March 29, 2011, a daughter, Olive, was born. The same year, David adopted Georgia’s illegitimate son, Tyler (born 2002), and on March 2, 2013, the star couple had a son, Wilfred. Two years later, his wife gave birth to one more daughter, named Doris.